Situated south of Na in the upper Rolwaling area, Ramdung, also called Ramdung Go, is one of acluster of peaks around the Yalung La (5,310m/17,421ft), a pass giving access to the upper Rolwaling from the south, via the Khare Khola. The peaks in the area were first explored by Scottish Himalayan expedition, led by Bill Murray in 1952, when three of the peaks near the pass, Yalung Ri (5,630m/18,471ft), Chhugyima Go (6,259m/20,534ft), and Ramdung were climbed. 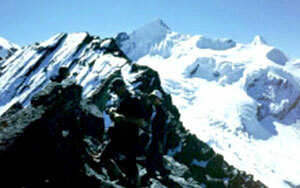 In 1955 the peak had its second ascent by members of the Merseyside expedition. Since then Ramdung has been climbed numerous times is an ideal summit for groups wanting to trek and climb in the still little visited Rolwaling Himal area.